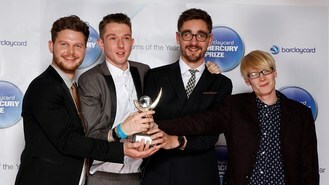 The Mercury Music Prize winners - Joe Newman, Gwil Sainsbury, Thom Green and Gus Unger-Hamilton - are determined not to sell-out, so when they were asked to cover a well known Cash song for an ad featuring a well-known British celebrity riding around on a tractor looking for chip ingredients, they said no. Gus revealed: "I like Johnny Cash. I wouldn't want to do that to Johnny Cash. They wanted everything. They said they'd put it online. 'We're going to film you recording it. It's going to be like we own you for this.' They didn't actually offer us a fee. They said, 'How much would you take to do this kind of thing?'." Thom chipped in: "Each a million cash," but Gus insisted: "I still couldn't do it." Thom agreed: "It's just not worth it." Since winning the prize propelled them into the spotlight, the young indie rockers have found some of the negative attention that comes with fame hard to deal with. "If someone doesn't like a band, that's totally fair enough," Gwil said. "But sometimes people might take offence at the individuals in the band, and that's strange." But Gus added: "I can sympathise with somebody who feels betrayed by their favourite band who were totally tiny, like we were getting to the level we've got to, because I probably used to be a bit like that. I'd feel twinges like, 'Oh, that kind of bums me out that this band's got so massive now."